Earlier this week, University of Alabama in Huntsville (UAH) atmospheric scientist John Christy testified at a House Science Committee hearing on the Paris climate treaty. Christy’s testimony covers several important topics including the “low effectiveness” of surface temperature records for detecting anthropogenic global warming, the “curious” procedure NOAA scientist Tom Karl used in his “pause-busting” adjustment of sea-surface temperatures, the “tiny” impact the Paris Agreement is likely to have on global temperatures, and the insufficient empirical basis for claims that climate conditions are worsening. Today’s post focuses on Christy’s rebuttal of a Yale Climate Connections video designed to discredit satellite data as a reality check on the models used by the UN Intergovernmental Panel on Climate Change (IPCC) to forecast global warming and the associated climate impacts. 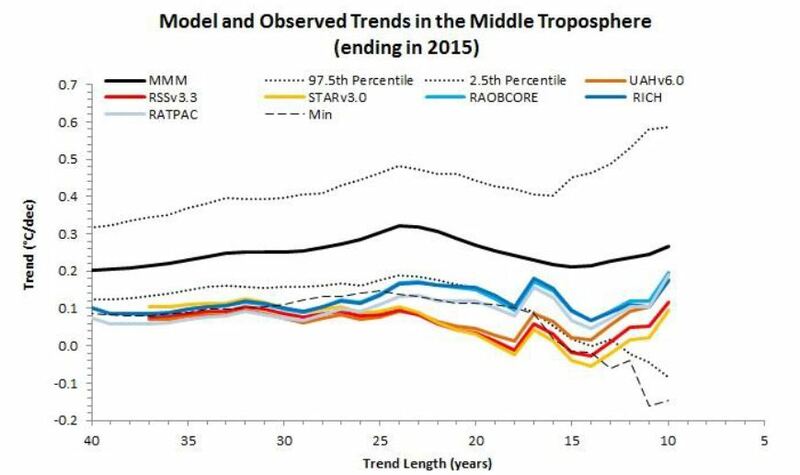 What’s got the climate establishment in a tizzy is a chart–Figure 1 in Christy’s testimony–that shows a growing divergence between model predictions and observed temperatures in the mid-troposphere (the layer of air from the surface up to 50,000 feet). The remainder of this post excerpts Christy’s defense of the satellite data and summarizes his rebuttal of a common criticism of Figure 1. I wish to make four points regarding the video and demonstrate the misdirection for which such agendized videos, along with a happily mimicking media, are so famous. 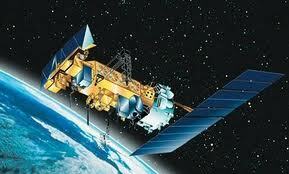 First, the claim is made the satellites do not measure temperature. In reality, the sensors on satellites measure temperature by emitted radiation–the same method that a physician uses to measure your body temperature to high precision using an ear probe. Atmospheric oxygen emits microwaves, the intensity of which is directly proportional to the temperature of the oxygen, and thus the atmosphere. 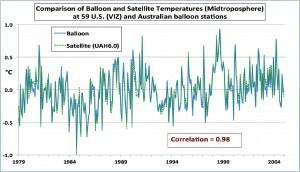 That the satellites measure temperature is evident by the following chart which compares our UAH satellite data with temperatures calculated from balloon thermistors. As an aside, most surface temperature measurements are indirect, using electronic resistance. Figure 2: Average temperature variations measured at 59 radiosonde stations in the U.S. (VIZ manufacturer) and Australia. Secondly, the scientists claim that the vertical drop (orbital decay) of the satellites due to atmospheric friction causes spurious cooling through time. This vertical fall has an immeasurable impact on the layer (MT) used here and so is a meaningless claim. In much earlier versions of another layer product (LT or Lower Troposphere), this was a problem, but was easily corrected almost 20 years ago. Thus, bringing up issues that affected a different variable that, in any case, was fixed many years ago is a clear misdirection that, in my view, demonstrates the weakness of their position. Thirdly, the scientists speak of the spurious temperature changes that occur as the satellites drift in the east-west direction, the so-called diurnal drift problem (which was first detected and accounted for by us). They speak of a sign error in the correction procedure that changed the trend. Again, this error was not a factor in the MT layer in Fig. 1, but for the different LT layer. And, again, this issue was dealt with for LT 10 years ago. 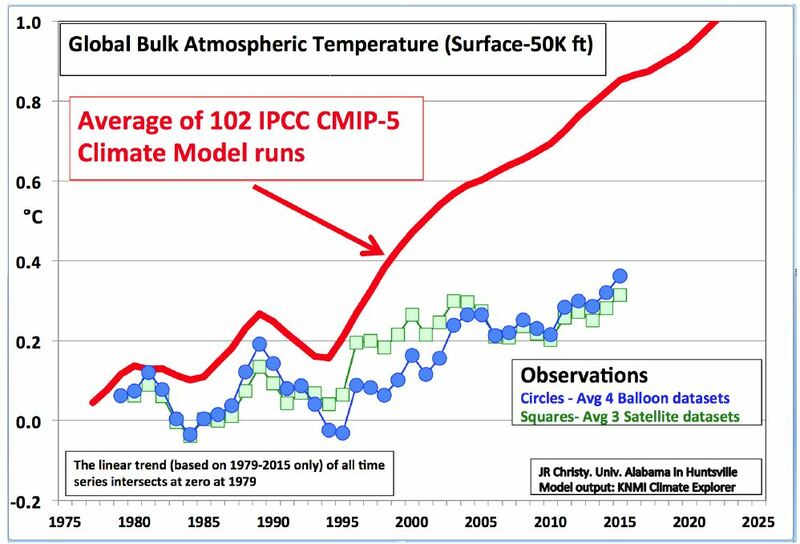 Although not specifically mentioned in the video, some “consensus” scientists claim that in Figure 1, Christy’s choice of 1979 as the baseline year makes the divergence between models and observations look bigger than if some other baseline–such as the average temperature during 1981-2000–were used. That is certainly the case, but the criticism is both disingenuous and irrelevant. It is disingenuous because it suggests the 1979 baseline was conveniently chosen to obtain a particular result. Not so. Christy chose 1979 because it is the start of the satellite record. Making 1979 the baseline year allows for easy comparison of model projections and observations over the full length of the 37-year satellite record. Figure 3: The linear trend line over the period 1979-2015. The colors represent the same source data as in fig. 1. 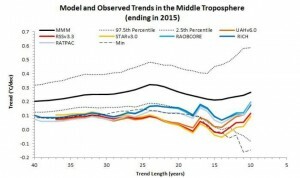 Finally, as Cato Institute scientists Patrick Michaels and Chip Knappenberger show, it is possible to construct a graph that does not compare models and observation from a baseline year or period but instead plots the modeled and observed warming rates in each year going back to 1975. The picture tells the same story as Christy’s charts. 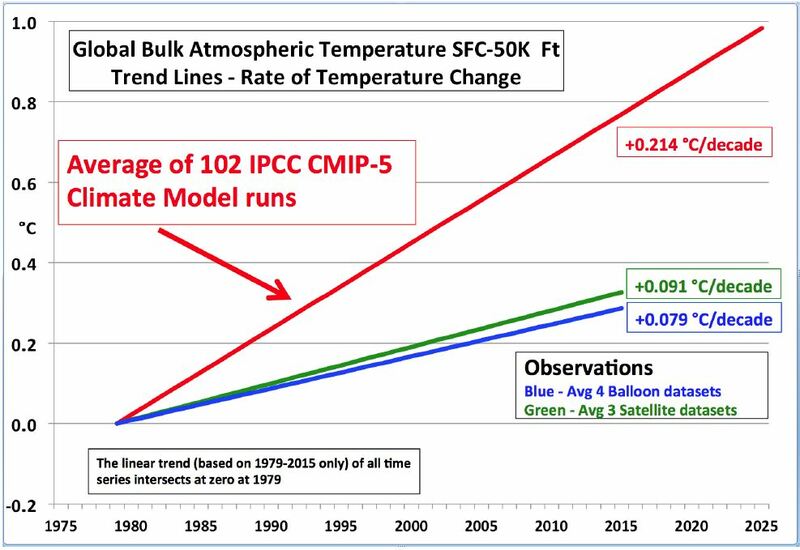 Figure 4: The annual average global mid-tropospheric temperatures derived from 102 individual CMIP5 climate model runs forced with historical (+ RCP4.5 since 2006) forcings were obtained from John Christy (personal communications). 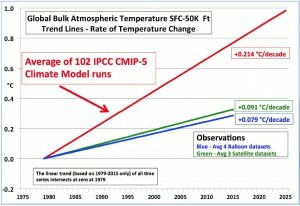 Linear trends were computed through the global temperatures from each run, ending in 2015 and beginning each year from 1975 through 2006. The trends for each period (ranging in length from 10 to 40 years) were averaged across all model runs (black line). The range containing 95 percent (dotted black lines) and the minimum (dashed black line) of trends from the 102 model runs are indicated. 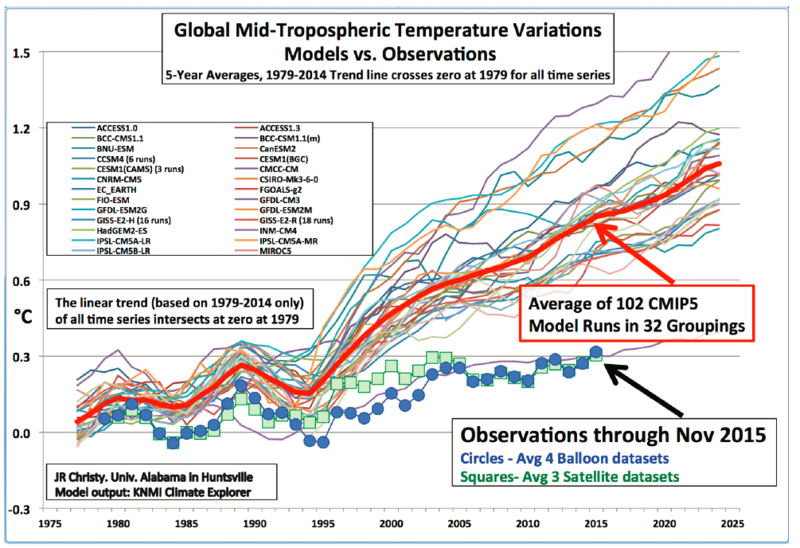 The observed linear trends for the same periods were calculated from the annual average global mid-tropospheric temperature record compiled by several different agencies (and include compilations derived from satellite observations as well as weather balloon observations) described in the legend (colored lines) (the value for 2015 was estimated from January through October, average (data provided by John Christy). 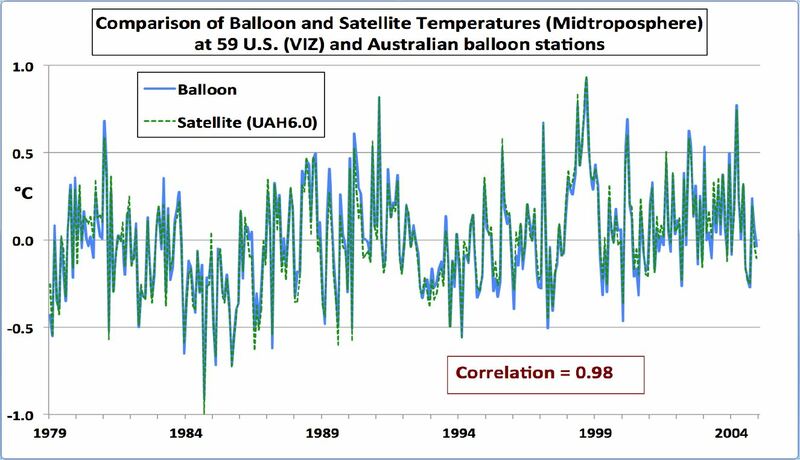 One other very encouraging result, using the satellite and balloon data, is that the observed trends are very flat, meaning that they are constant, neither increasing nor decreasing depending upon length of record. Greenhouse physics actually predicts this, so what we are seeing may very well in fact be the greenhouse-gas-generated response, not random noise. 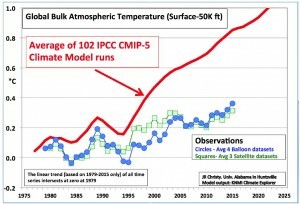 It is simply that the rate of warming is far beneath what has been forecast. Previous post: UN Framework Convention on Climate Change Secretariat Announces Steps for Signing and Ratifying the Paris Climate Treaty. The Next Step Is Up To the Senate.